Keep you and your bees safe with VIVO's stainless steel beehive smoker (BEE-V001). The solid 11" smoker produces safe cool smoker that calms bees and helps prevent stings while you perform hive maintenance. The holding canister measures 7" tall with a 4" diameter for storing long lasting fuel of your choice. Perforated removable fire base provides air pockets at the bottom of the smoker to encourage good airflow and keeps the fire directly off of the bottom. 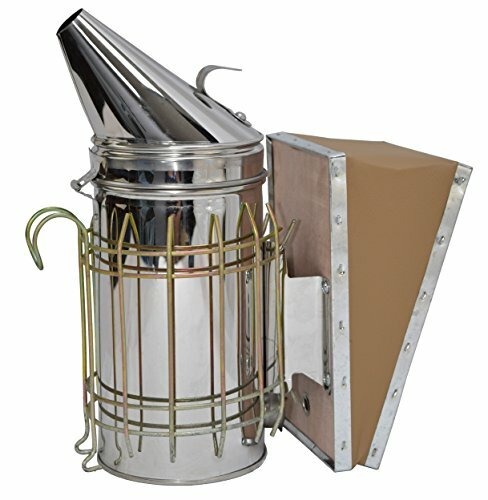 Our smoker is safe and easy to use for beginner and advanced beekeepers! ✓ MEASUREMENTS from the bottom to the tip of the nose is 11" with a canister diameter of 4"